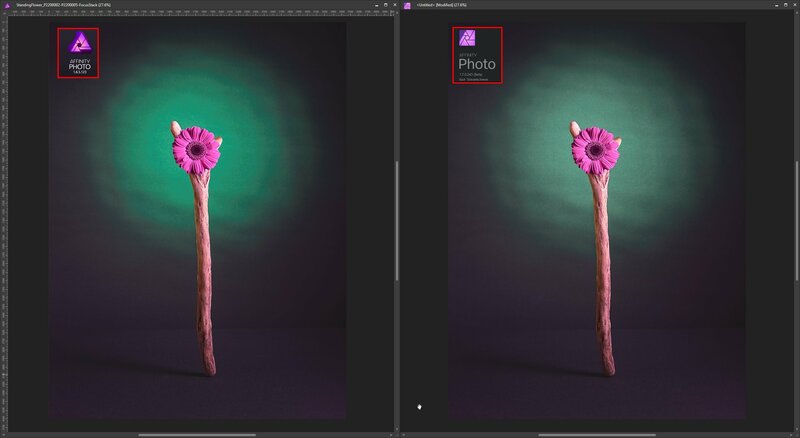 I noticed that the same .afphoto file opened in 1.6.5.123 and in 1.7.0.243 Beta looks different. The file was edited in 1.6.5.123 and saved. Then opened in 1.7.0.243 Beta (making a copy at the non-Beta prompt). The Windows version of the applications. Could this difference be down to the rewrite of the HSL and/or Recolour adjustments? To test this, I created a stamp layer in 1.6.5.123 and saved, then reopened the file in Beta. They looked the same. This suggests that the adjustments are rendering things differently. 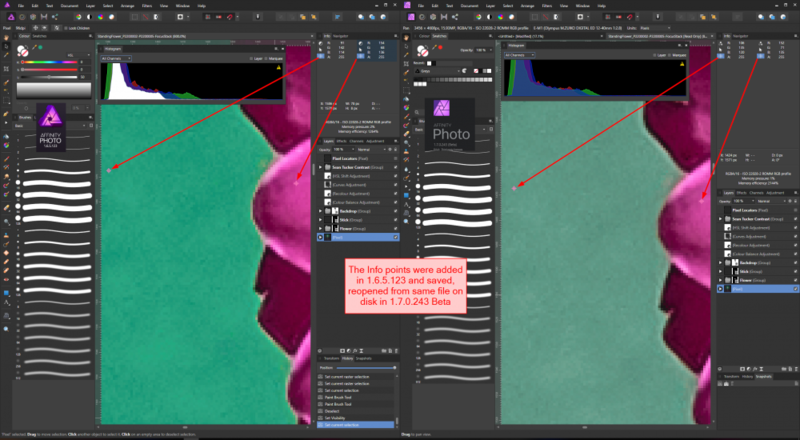 Going a bit further, with an instance of each application version open, I hid all layers except the Background, which like the Stamp layer looked exactly the same. Then turned on layers one by one in each instance. When I encountered the first HSL adjustment, the differences started. There's a few HSLs in my document, and they are the ones that appeared to have the biggest rendering difference. The ICC profile is the same for each image. I've attached a side by side screenshot. The concern is that images edited in an older version of AP will no longer be as they were intended when opened again in future (e.g. to reprint for a client). I can provide the .afphoto file if required? Sounds plausible, thou it would suggest that a legacy conversion (or legacy behavior, like opening old files keeps old HSL layer, but allows to create only new one) or such should be done somehow to achieve coherency between these implementations. We saw this reported with another forum user. As far as I am aware it is being looked into. This is due to some of the adjustments and filters being updated for 1.7. From what I can tell, some of the adjustments and filters from 1.6 will open in 1.7 and use the old dialog so you shouldn't be seeing any change in the opened document. It seems a few of them are forcing this change which is a worry for reprints etc. like you've mentioned. I'll chase this up for you. This is a similar thread. I've read that similar thread, and will try some more tests and upload them here when I get home this evening. Thanks for chasing it up. Got to do the additional checks that were indicated in that similar thread you linked to. One is the difference blend mode. I took a Stamp in 1.6.5 and saved. Opened the file in 1.7 (using the Make Copy option so that it would be editable). Made the 1.6.5 stamp hidden and took a new stamp. 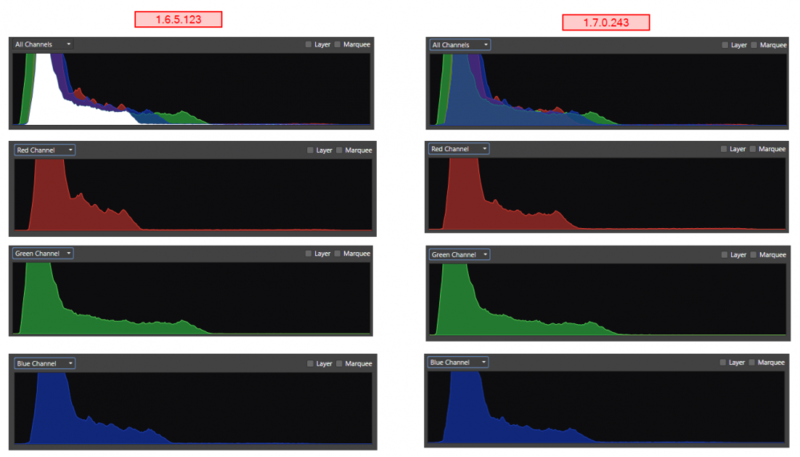 The final one is a screengrap series of the Histogram in both application versions. All channels are different, but the biggest is in Red. I checked the Preferences panel. With the exception of the new options available in 1.7.0, the Disk Usage Warning, and some keyboard shortcuts I hadn't bothered to reconfigure, there's no difference between the two versions. I've also included the expanded layer stack so you can see exactly what I've used. If I can get you any more info to help in your investigations please just ask. 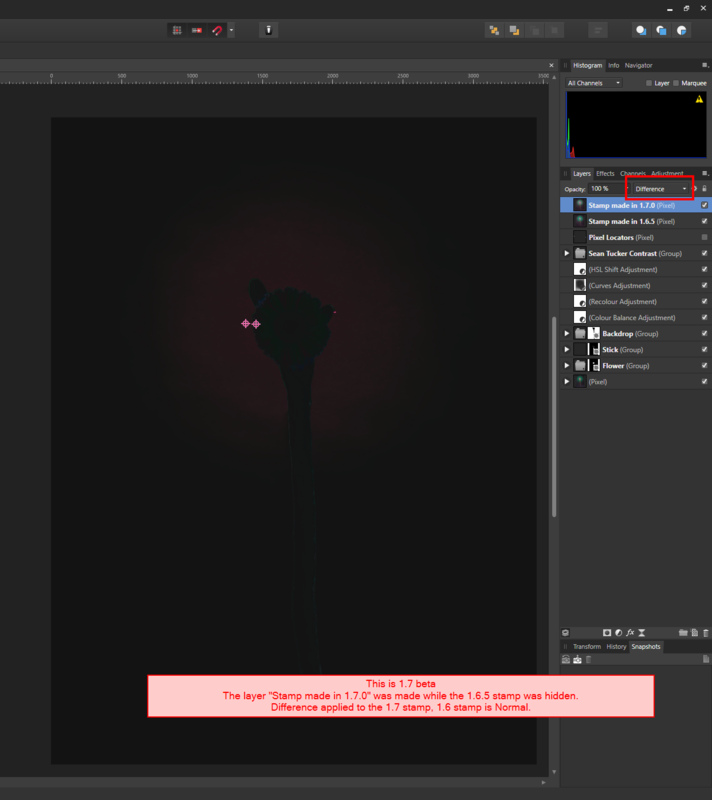 You have a number of Adjustments above the pixel layer, you are going to see a difference between 1.6 and 1.7. I built a similar file to yourself and could indeed see the difference in the RGBA values in the Info panel using the targets. Once I began to uncheck the numerous adjustments, the values returned to being identical between 1.6 and 1.7. I've just had a chat with the developers and we're going to identify the old adjustments as legacy adjustments in the Layers panel so you can easily identify old from new. Thanks Chris. That sounds like it'll be helpful.